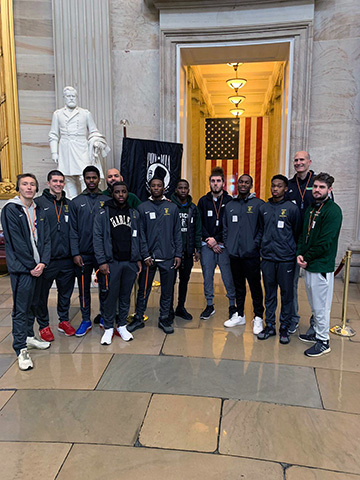 Washington - The Mercer County Community College (MCCC) men’s basketball team took a trip down the east coast to visit Washington D.C. on the weekend of Dec. 22. Organized by Head Coach Howard Levy, the Vikings stayed overnight in the nation’s capital for an outing that saw the team bond over more than just basketball. The weekend in the capital stems from Levy’s Washington network. “I spent 7 years in Washington as a coach, law student and a lawyer, so it’s an important place for me. Having my friend John Thompson III as the Georgetown coach when I started at Mercer gave me an opportunity to do something special for the team,” Levy said. Levy’s connections to the area opened the door for the retreat, which he holds annually. This year, the team toured the U.S. Capitol and had dinner with some of Levy’s friends from the area, which he hopes create meaningful connections for the players. Of course, basketball played a role in the tour as well. The Vikings practiced at the brand-new Washington Wizards practice facility, the St. Elizabeth's East Entertainment and Sports Arena, in southeast D.C. The next day they played a game at Frederick Community College. At the Wizard’s facility, the Vikings followed the Phoenix Suns onto the court, and had the opportunity to meet NBA veteran and three-time Sixth Man of the Year, Jamal Crawford. “We lost a hard fought game to a terrific Frederick team, but the entire trip was completely worth it,” Levy said. Though the Vikings fell 82-87, the competitive overtime contest will be one of many memories the Vikings share from the trip. Sophomore forward and Business Administration major Adnan Bajrami was particularly excited for the trip. “I was at a university before I came to Mercer and we never had the chance to do anything like this,” he said. Bajrami enjoyed the tour of the Capitol, but noted that playing at the Wizards’ facility was a highlight. “I might not have the chance to do something like that again,” he raved..
As the Vikings broke a double-digit win total in January, the team’s success is reflective of their unity. 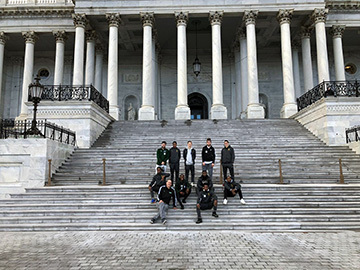 The 2018-19 men's basketball team toured the U.S. Capitol. The team posing on the steps of the Capitol Building. 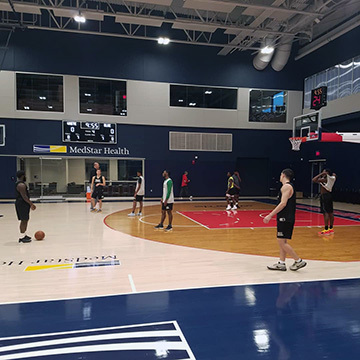 The Washington Wizards hosted one of the Vikings' practices at its St. Elizabeth's East Entertainment and Sports Arena training facility.